Few positions are more important to a hockey team than the goaltender. The goalie is captain of the defense and the player that has the most direct outcome on the final score. Having a good goalie is essential for any team that wishes to be successful. And in order to be a good goalie, you need to possess a high I.Q. For Quinnipiac women’s ice hockey goalie Sydney Rossman, her intelligence has helped her find success both between the posts and in the classroom. Rossman, a junior marketing major from Minnesota, graduated high school as part of the national honor society and has been named to the All-ECAC Academic Team in both her freshman and sophomore seasons at the collegiate level. Rossman says while hockey is her passion, it is her academics that drive her, and that a desire for a good education is what would eventually bring her to Quinnipiac. “Academics is huge. We are all students before we are athletes,” Rossman said. “I originally heard about Quinnipiac because of hockey, but it was the academic reputation that won me over. Despite the chances of playing professionally now being an option following the inaugural season of the National Women’s Hockey League, Rossman wants to pursue a job based on her degree following graduation. Quinnipiac head coach Cassandra Turner feels that Rossman’s intelligence has been a key for the goaltender’s transition to the college game. 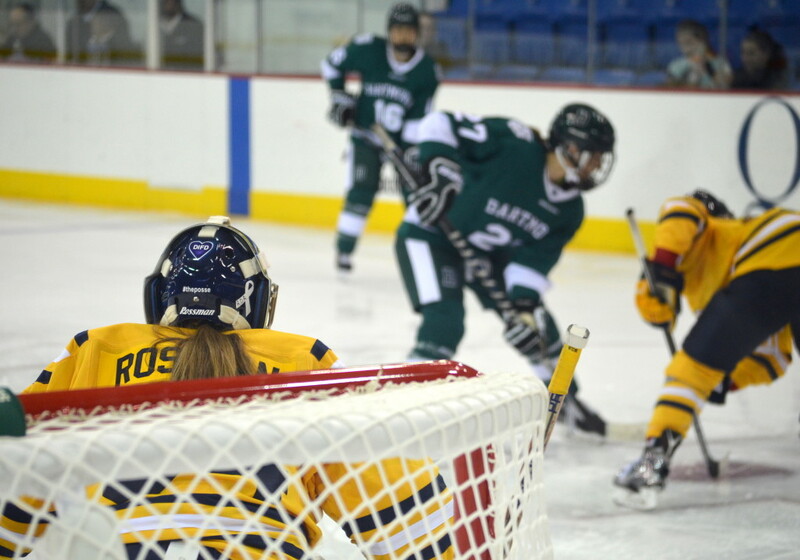 While Rossman has always been an impressive student, her impressive goaltending skills are what drew the attention of the Bobcats’ recruiting staff. Over her four seasons playing for Minnetonka High School, Rossman allowed an average of 1.13 goals per game, and went 55-10-2 on the way to winning three AA state championships for the Skippers. Additionally, Rossman was named the top goalie in the state of Minnesota during her senior year. Despite not starting immediately, Rossman was able to demonstrate her on-ice IQ and her desire to improve during her first two seasons on campus as she sat behind former goaltender Chelsea Laden, who has graduated and now plays for the Connecticut Whale of the NWHL. Due to Laden’s presence, Rossman was limited to 12 appearances in two seasons, with only six of those coming as starts. In those games, Rossman was still impressive, as she went 4-0-1 with a 93.3 percent save percentage and allowed an average of 1.21 goals per game. While the number of appearances was a small sample size, they were all games of large importance. Rossman shut out then No. 8 ranked Clarkson on Valentine’s Day, and started the program’s first national tournament game against Harvard on March 14th. While the team would go on to lose to Harvard, Rossman describes the game as a chance to grow as a team. Rossman credits her time playing behind Laden during her first two seasons as preparing her for taking over as the Bobcats’ starter. Despite playing well in her limited game time the last two seasons, many wondered how Rossman would handle the transition to top choice goalie. Thus far, as the season has progressed Rossman has begun to make a name for herself around the country. In her 17 starts this season, Rossman has gone 13-1-3, allowing 1.10 goals per game, the third fewest in the nation, as well as stopping .939 percent of shots she faces. Additionally, Rossman has five shutouts this season, including a program-record streak of 296:42 minutes without allowing a goal. Rossman’s stellar play has earned her national praise. She was named the ECAC goalie of the month as well as the Quinnipiac woman’s athlete of the month for the month of November. Rossman has also been named the ECAC goalie of the week three times this season. This smooth transition of Rossman’s has been a major key to the Bobcats being ranked 4th nationally. For Laden, there never a doubt that Rossman would be a successful starter for the Bobcats. One area in which Rossman has consistently showed up for the Bobcats this season is in overtime. In their 17 games, the Bobcats have had five games reach overtime. After tying in their first four overtime games, Rossman stopped 21 of 22 total shots and help the Bobcats win their first OT game 2-1 over rival Harvard on Dec. 5th. Rossman described what she does to prepare herself when she knows overtime is looming. While Rossman is taking strides in the right direction, both she and Turner feel the junior has room to improve before reaching championship goaltender status. Another area of difficulty for Rossman is maintaining full concentration during a game, despite not always facing many shots. With the Bobcats currently allowing 18.5 shots per game, Rossman will sometimes go long stretches of the game without being called into action. To help become accustomed to this, Rossman reached out to men’s ice hockey goalie Michael Garteig for advice. Should Rossman hope to make that last step to the championship goaltender status, she would be wise to heed the advice Garteig, Laden, and Turner have passed down to her. Yet, with the desire to improve and win that Rossman has showed in the past, as well as the flashes of greatness she has displayed this season, Quinnipiac is optimistic that its junior goaltender can help the program achieve its ultimate goal of winning a National Championship. Last season, Quinnipiac women’s ice hockey had its most successful season in program history. After going 26-9-3, and winning the ECAC Hockey regular season title, the Bobcats would go on to lose to Harvard in the national tournament. Despite the success, Quinnipiac would undergo a coaching change on Apr. 9, as officials from the school approached former coach Rick Seeley with several allegations, including that he had yelled at a student on the hockey team and grabbed her by her helmet chin strap. Following the dismissal of Seeley, Cassandra Turner would be named the interim head coach, and has since been named full-time head coach. Instead of having the change in leadership be a transitional period for the team, the Turner era has gotten off to a smooth start as the Bobcats are currently 4-0-1 on the season. For Turner, success is like second nature, as she has achieved it since her playing career at Brown. During her four-year stint with the Bears, Turner won two Ivy League and two ECAC championships, as well as appearing in two NCAA Tournament National Championship games. Turner credits her time playing at Brown under head coach Margaret Murphy as what laid the foundation for her coaching style. Turner also credits Murphy for guiding her and fellow teammate, and current Princeton assistant, Cara Morey toward becoming coaches. Turner said the extra responsibilities would finally help her realize she wanted to be a coach. The main experience Turner credits is when the Brown coaching staff entrusted her to teach a teammate, who had played for the US National team as a forward, how to become a defender. While the emergence of Turner may have surprised a few people, Quinnipiac Director of women’s ice hockey operations Paul Nemetz-Carlson has been one of Turner’s biggest advocates. A member of the Quinnipiac coaching staff for 13 years over two tenures, Nemetz-Carlson would give Turner her first coaching job, as a graduate assistant, at Division III Elmira College while Nemetz-Carlson was the head coach. 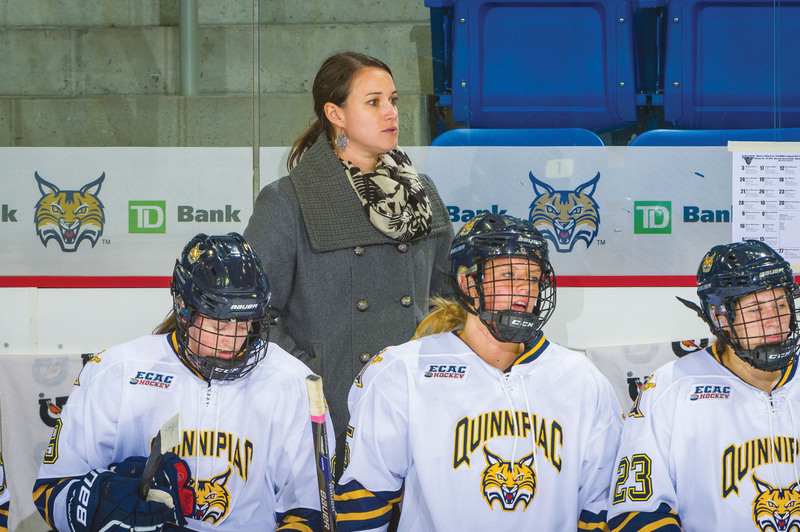 Turner’s skill as a coach, especially on the defensive end, has been apparent throughout her tenure with Quinnipiac. This was especially prevalent last season, as a Turner-led defense would allow a mere 45 total goals throughout the season, the fewest in all of Division I hockey. Turner attributes the team’s stringent defense to the attention to detail her players possess, as well as the culture of the locker room. One way in which Turner instills this attention to detail in her players is by preaching the importance of hustle stats. Turner discussed the importance the team places on winning each period as its own game, measuring shots allowed vs shots taken, and keeping the team’s penalty minutes for the game under six total minutes. A key area in which Turner has been able to aid the team in reaching these unheralded levels of success, is in her skills as a recruiter. Since taking over as the program’s recruiting director, Turner has been directly involved with the recruitment of 13 players who have gone on to win All-ECAC honors, such as captain Cydney Roesler. While playing under Turner for Hockey Canada, Roesler was given a two week crash course in Turner as both a person and a coach over the two week tournament. Roesler said Turner’s enthusiasm to not only win, but to make everyone around her better was the major driving force that led Roesler to Hamden. While working against Turner at Yale and then with Turner at QU, Nemetz-Carlson has seen Turner both as an ally and as an enemy when it comes to recruiting. Carlson described how Turner has a way of showing recruits how much she cares about them. Nemetz-Carlson went on to explain that the main quality that everyone in the program shares, is a dedicated vision of working hard, and winning the national championship that has thus far alluded them. Roesler also described the perception her and her teammates have of Turner, both as a coach and as a mentor. So far through the team’s first five games, you could hardly tell there was a coaching change this offseason. Turner talked about what has made her transition so seamless and “fun,” but also pointed out where she wants improve. As for the rest of the season, Turner’s goal for the team is for them to figure out how to play their best hockey each day. Along the way to achieving this goal, Turner believes the team’s true potential will reveal itself, although she admits there are lofty goals in their crosshairs. There are few more decorated freshman in college hockey this season than Melissa Samoskevich. A 5-foot-4 winger with a fierce left-handed shot, Samoskevich possesses insane amounts of natural talent. From her burning speed, her ability to use her body to protect the puck, and a viciously quick release, the Connecticut native has all of the natural abilities to be an offensive force at the collegiate level. In her young career, Samoskevich has shown a penchant for using these skills. An alumna of Minnesota’s Shattuck St. Mary’s, whose hockey program has standout alumni including Sidney Crosby, Nathan MacKinnon and Jonathan Toews, Samoskevich scored 94 points (56 goals, 38 assists) in her 50 career games. That total was a full 40 points more than any of her other teammates. While in Minnesota, she served as captain of a Sabre’s team who boasted 16 fellow Division one hockey commits. Another place that Samoskevich has shined is when she played for the United States national team. Throughout her tenure playing for the U.S., Samoskevich has shown great versatility, thriving as both a defender and as a forward in various competitions. As part of the 2015 U.S. under-18 World Championship team in Buffalo, Samoskevich’s tournament-high six goals and two assists would help lead the team to a gold medal. Following the tournament, she was named to the Media All-Star team. Samoskevich would continue her international duty this past summer. She was named an alternate for the national team’s camp, and eventually would play for the u22 team in the August festival. Samoskevich and Quinnipiac head coach Cassandra Turner both credit this summer of international hockey for helping her have an easier transition to the speed and style of college hockey. Following such a decorated high school and international career, many top tier universities took notice of Samoskevich. Storied programs such as Minnesota, Boston College and Wisconsin offered her scholarships. Yet, she was able to tell immediately that the best school for her was the one closest to home. Despite already leaning toward coming closer to the east for college, following the shooting at Sandy Hook Elementary School, the Sandy Hook native knew she wanted to play closer to home and her family. “I knew I wanted to come closer to home, and that I wanted to play on the east coast. I have a brother and sister, who are twins, that had aged out [of the school] that year, and it was really hard for me, because I never got to see them when I was in high school.” Samoskevich detailed. On the ice, Samoskevich has had a very smooth transition through her first few games. Playing on the second line alongside Emma Woods and former u18 teammate T.T Cianfarano, the trio has been the Bobcats most lethal offensive weapons to start the season. In the first four games, their line accounted for eight of 13 goals scored. Samoskevich has a goal and five assists on the season. Samoskevich credits the similar styles of her, Woods and Cianfarano as the key to their early chemistry. As for Cianfarano, she feels the chemistry between the girls is so natural it occurred nearly instantly. A sophomore who came into Quinnipiac with tons of accolades in her own right, Cianfarano knows plenty about living up to hype. She was the Bobcats leading scorer as a freshman. Now, Cianfarano has saught after taking her new teammate under her wing to ensure Samoskevich has a debut campaign as successful as her’s was last year. For Coach Turner, Samoskevich’s seamless transition both on and off of the ice has not come as a surprise. Samoskevich, who originally committed to Quinnipiac while Rick Seeley was still the coach, loves the style of Turner, the new coach. Samoskevich credits the atmosphere that Turner and the coaching staff create, as making her time in Hamden so pleasureable thus far. Despite this being her freshman season, Woods feels that Samoskevich has fit right into the team, and plays beyond her age. Despite only being on a line together for the last two weeks, Woods has also noticed playing alongside Samoskevich brings out the best in her game. As for the rest of the season, Turner has conservative expectations for her young forward, despite the hot start. Turner believes that Samoskevich’s main goal for the season should be acclimating to the style of the college game. While the season might still be early, Melissa Samoskevich is well on her way to exceeding those expectations, and becoming a force for Quinnipiac women’s ice hockey. 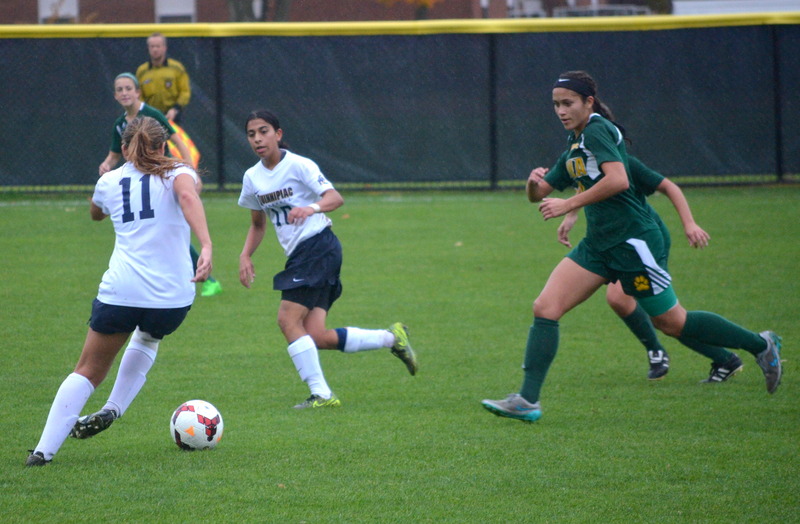 For women’s soccer freshman Nadya Gill, the transition to college athletics has gone without an issue. In fact, it’s gone better than she might have imagined. The Toronto native, who won’t turn 18 years-old until Sept. 26, has scored three goals in her first five collegiate starts. All three of her goals were game-winners. Despite her individual success, Gill is quick to pass the acclaim off to others. For Gill, this isn’t her first time making an instant impact for her team. In 2013, at just 15, Gill played a major part in helping Team Canada bring home silver from the U17 CONCACAF tournament. In the tournament, the top teams from North and Central America, as well as from the Caribbean compete for a place in the World Cup. Despite never starting for the team, Gill scored a goal in each of her four relief appearances. This time playing for the national team is an experience Gill will never forget. It was this time playing for the national team that eventually put Gill on Quinnipiac’s radar. When it came to choosing schools, education was something that Gill really focused on. With the school meeting Gill’s criteria, Clarke would use his connections in United States soccer to open the conversation with her and her national team coach. Gill has had instant success in her short tenure in a Bobcat uniform, but it isn’t a surprise in the eyes of coach Clarke. There are few challenges more daunting than following in the shoes of a legend. After losing Borja Angoitia, who graduated last year, many people are wondering how men’s soccer will replace the reigning Metro Atlantic Athletic Conference Goalie of the Year. “I don’t feel any pressure taking over for Borja [Angoitia], I’m here to make my own legacy,” Henry said. “While [Angoitia] was great and made major contributions to this team, I am the one wearing the No. 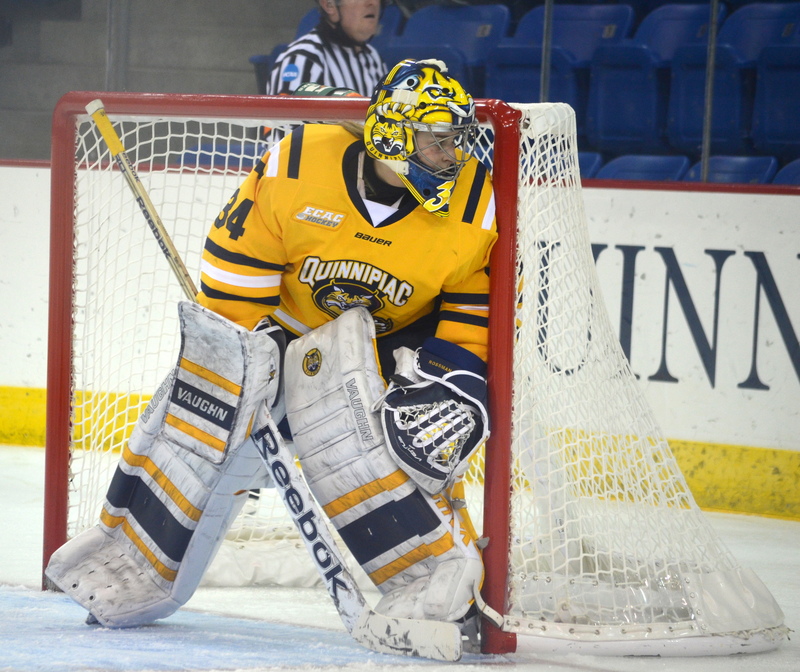 1 jersey and the gloves now, so whatever happens now is up to me.”Through his first three games of 2015 transfer Triston Henry looks well on his way to creating his own name as Quinnipiac netminder. Henry looks well prepared to start a great career of his own in Hamden. At 6-foot-1, Henry possesses blink-of-an-eye quickness and the vocal ability to control the Bobcats’ defense. His playing style, as he puts it, is inspired by his favorite player: Juventus F.C. goalie and captain Gianluigi Buffon. And looking past his skills on the field, Henry also has shown the ability to be a central part of a winning team. In his two seasons at Herkimer County Community College, he led the Generals to back-to-back National Championship victories. Henry’s true prowess in net was evident during the 2013 season, in which he allowed a mere four goals all season and was named an All-American. Following his time in junior college, Henry transferred to the University of Connecticut. Unfortunately, Henry didn’t fit into UConn head coach Ray Reid’s plans, as he puts it. He didn’t play during the 2014 season. 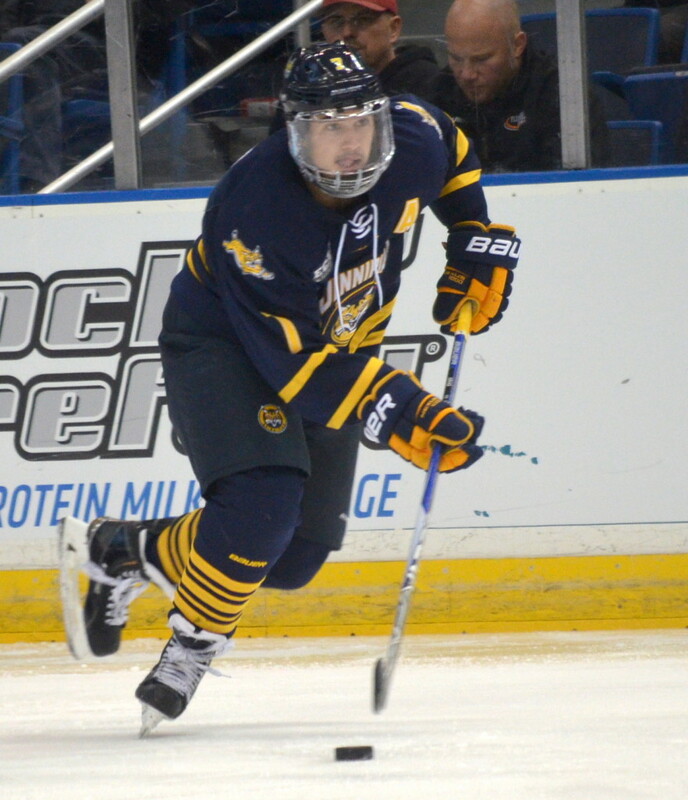 After last season, head coach Eric Da Costa saw an opportunity to bring Henry to Quinnipiac. Da Costa tracked Henry while back in his hometown of Toronto and followed his progress at Herkimer. Da Costa also got help from former Quinnipiac forward Raphael Carvalho, who also played at Herkimer. “We are very happy to have landed a player who has been on our radar for such a long time,” Da Costa said. Henry also credits Carvalho as the reason he is currently at Quinnipiac. Henry has done plenty to justify Da Costa’s confidence in his short time here. In his first three games for the Bobcats, he has recorded a clean sheet and has stopped 22 of the 25 shots he has faced thus far. So far this season, Henry’s play has been crucial to the Bobcats, who have had trouble scoring. In fact, Quinnipiac hasn’t scored yet in its first three games. Perhaps his best performance to date came on Aug. 31, when he recorded a six-save shutout against UConn, his former team. There are huge expectations for the Bobcats this year. After a disappointing showing in the MAAC tournament last year, many expect them to not only contend in the tournament, but to finish with the regular season title as well. If this scenario is to play out, it will be essential that Henry helps carry Quinnipiac to that point. Following a 9-7 victory at Canisius in its last game, the Quinnipiac men’s lacrosse team (4-7, 3-2 MAAC) looked set to clinch a trip to the MAAC Tournament on Saturday. First, they had to go through Monmouth (5-6, 2-2 MAAC). Quinnipiac was successful, coming from behind to down the Hawks 9-8 in its final home game of the regular season. “You have to be able to close the game if you want to be able to win a championship, you have to be able to play your best lacrosse at the end of the game, and I am incredibly proud of my boys today,” Fekete said. After a ceremony honoring the senior class prior to the game, Monmouth came out looking to spoil the Bobcat’s special day during the first half. Despite goals from freshman Brian Feldman, senior Steve Bryant and junior Ryan Keenan, Quinnipiac found itself staring at a 7-3 deficit at the half. Following the game, Quinnipiac head coach Eric Feteke spoke of how the scoreline wasn’t accurate of how his team had played in the first half. Senior goalie Jack Brust then shutout the Hawks in the third and the Bobcats’ offense found new life. Led by goals from Matt Kycia and Nate Nibbelink, the team entered the fourth down two scores. Thanks to quick goals from Matt Diehl and senior Michael Sagl, Quinnipiac pulled even for the first time in the game with 10 minutes left to play. Sagl and Feldman then each scored their second goal of the game to put Quinnipiac up 9-7. A late goal wasn’t enough for Monmouth, as Quinnipiac secured the win and is headed to the playoffs. Now following their win the Bobcats clinched their spot in the MAAC tournament, something that the team missed out on last season. Quinnipiac will fly out to Colorado on Tuesday and prep for its final regular season game against Air Force in Falcon Stadium on Thursday. Lacrosse is the fastest growing sport in the United States. According to the United States Lacrosse Association, more than 750,000 athletes are playing stateside as the sport continues to boom with schools adding teams. In Canada, meanwhile, the same sort of boom has taken place, just in different form. Many Canadian lacrosse players prefer to play a lacrosse variant called “indoor lacrosse,” instead of traditional field lacrosse. In indoor lacrosse, sometimes known as “box lacrosse,” teams are only allowed to have six players on the field. as opposed to the traditional 11 in field lacrosse. The game also takes place in a court the size of a hockey rink. For Quinnipiac men’s lacrosse players Ryan Keenan, Adam Bellamy and Riley Palmer, indoor lacrosse comes more natural than the type of lacrosse they play at Quinnipiac. All three Canadian-born players started playing box lacrosse before they were 7 years old, and had to undergo certain adjustments to the United State’s version of the game. Keenan explained his increased comfort in playing indoors as opposed to on a field. “Growing up in Canada, indoor [lacrosse] is what we do better because it is what we have done longer, and it honestly just comes more naturally,” he said. Keenan’s father is a former player and current head coach and general manager for the Edmonton Rush in the National Lacrosse League. The attackman admits that he is still adjusting to U.S. lacrosse. Bellamy, a freshman defender, played his junior indoor lacrosse as an attackman for St. Catharines Athletics. He attributes much of what he learned playing indoor lacrosse for where he is as a lacrosse player today, and says that playing box lacrosse provided some major advantages to his current game. Keenan added that there are many positive things that come from the transition. Palmer, a freshman midfielder, played his junior lacrosse alongside Keenan for the Whitby Warriors. He believes the experiences playing indoor helps give him a mental edge. For Keenan and Palmer, their time with Whitby also represents a high point in their young lacrosse careers. The Warriors won the Minto Cup in 2011, a 114-year-old junior lacrosse tournament in Canada. Keenan played during that season with future professional lacrosse players Mark Matthews and Zach Palmer, who is Riley’s older brother. Then, in 2013, the younger Palmer joined Keenan and the Warriors, who went back to the Minto finals. In just two years, Shiann Darkangelo has left her mark on the Quinnipiac women’s ice hockey program. Despite spending her freshman and sophomore seasons at Syracuse University, the senior forward has helped elevate the Bobcats to new levels. Last season, her first at Quinnipiac, Darkangelo registered 40 points. The total is the fifth highest in program history. Darkangelo said she didn’t know what to expect when she first got to Quinnipiac, and that she didn’t even know if she’d earn playing time prior to the start of the season. Now, in her second season with the team, Darkangelo’s performance both in games and in the locker room has been a major factor in Quinnipiac’s rise to a No. 5 national ranking. On the ice, Darkangelo plays on the first line with junior Nicole Kosta and senior Erica Uden Johansson. The line has been a consistent force for the Bobcats on both ends of the ice, as the three players lead the team in plus/minus this year. Darkangelo also described the balance in the three player’s attributes, which she feels makes the line work well together. Despite being one of the team’s most well-rounded players, Seeley still sees areas in which Darkangelo can improve her game. 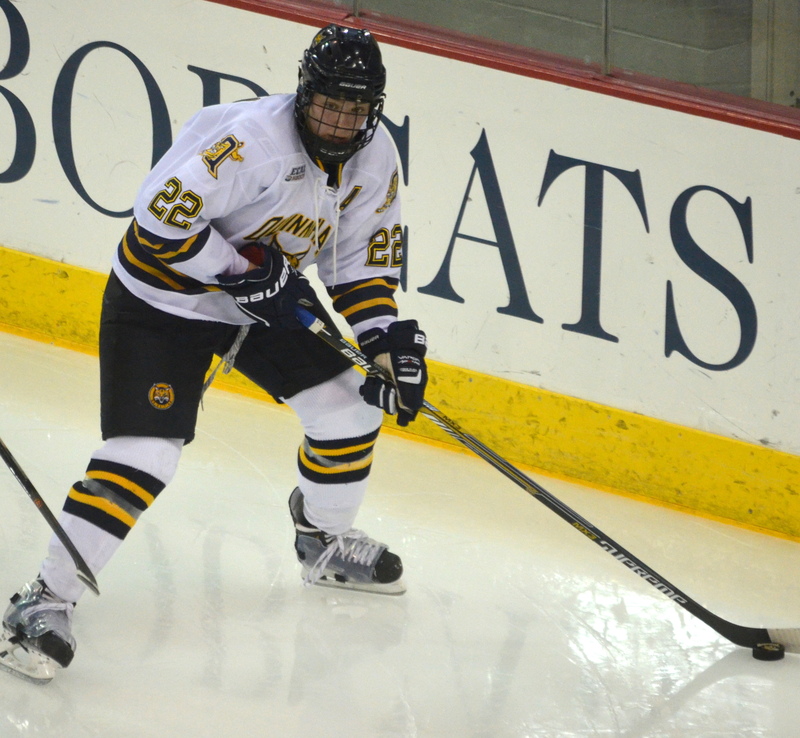 In Quinnipiac’s Jan. 30 game against Harvard, Darkangelo put her name in the program record books once again. With her second period assist, Darkangelo became the second player in team history to register 100 points for her career. One of the contrasts Darkangelo has noticed about Quinnipiac in comparison to Syracuse is the general atmosphere surrounding the program. Growing up with five other siblings, Darkangelo’s competitive nature has been present since her youth. The competitive relationship with her brother led to Darkangelo’s start in hockey, as well. Now, with just four games left before the conference tournament, Darkangelo and the Bobcats have big goals they hope to accomplish during the remainder of their season. In terms of her own play, Darkangelo just wants to help the Bobcats reach those goals in any way possible. Sam Anas has hit the ground running as an underclassman at Quinnipiac. This year, the sophomore forward is building on the momentum that began during his award-winning freshman season, where he earned the Tim Taylor Rookie of the Year award. Following his freshman year, in which he led the team with 22 goals and 43 points, Anas has already recorded 10 goals and eight assists for a team-leading 18 points in the 2014-15 season. Anas shared how he has been able to have such a smooth transition to the college game. Additionally, Anas credits the two years he played amateur hockey for the Youngstown Phantoms of the United States Hockey League as a key in his transition. During his two-year stint in Youngstown, Anas scored 54 goals and recorded 43 assists for 97 total points in 155 games. He finished third in the league in goals during the 2012-13 season. In a conversation about his leading scorer, Quinnipiac head coach Rand Pecknold reflected on what a special player Anas is, and how much he adds to the team. Senior captain Matthew Peca, who centers the first line with Anas and Smith, talked about what it’s like to play with the second-year wing. Peca added that Anas isn’t only a great scorer, but a great passer, too. Peca said Anas is a leader off the ice, as well. Anas first began playing hockey with his dad, Peter, early on in life. Peter played at the University of Western Ontario, and introduced the game to Anas at a very young age. “[My dad] got me started when I was two years old shooting the ball around in the kitchen,” Anas said. Nineteen years later, Anas’ talent is drawing NHL attention. In the past few summers, he has participated in developmental camps with the Washington Capitals, and most recently with the Montreal Canadiens. Training with the Canadiens last summer was an “eye-opening experience,” he said. Anas said that he doesn’t model his game after one specific player, but that he does enjoy watching Minnesota Wild left wing Zach Parise play because of his skill and hard-working attitude. In addition, he idolizes New York Rangers right wing Martin St. Louis. For Anas, he is looking to improve deficiencies in his game, while Quinnipiac as a whole has lofty goals set. After starting the season ranked No. 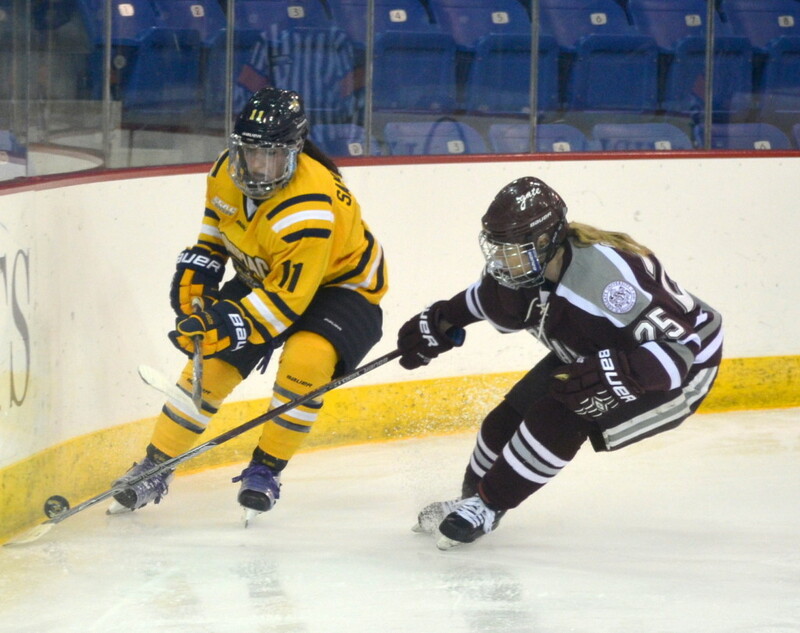 10 in the country, the Quinnipiac women’s ice hockey team has now risen to No. 5 and continues to build momentum. While many factors have contributed to the Bobcats’ 7-0-1 start, few can argue the play of senior goalie Chelsea Laden, as well as the team’s defense, have been a driving force to its success this year. Laden, the ECAC Hockey Goalie of the Month in October, has been reliable in net for the Bobcats all season. Laden has gone 7-0-0 in seven starts, posting an 0.29 goals against average. Laden tops all of Division I women’s ice hockey goalies with a .974 percent save percentage on the season. She is also leading the nation with five shutouts, which is the fourth most shutouts in a season by any goalie in Quinnipiac program history. The Bobcats currently own a nation-leading 0.38 goals against average, which Quinnipiac head coach Rick Seeley credits to Laden’s dependability in net all season. Laden also notes the growth in confidence that both she and her team have undergone since last season. Laden and the Bobcats are coming off a record-setting game, recording the first shutout win in program history at Cornell, which was also the first time Cornell had been shut out at home since Nov. 17, 2006. Despite the individual statistics and acclaim that has been coming her way, Laden remains humble, crediting those in front of her for such success. 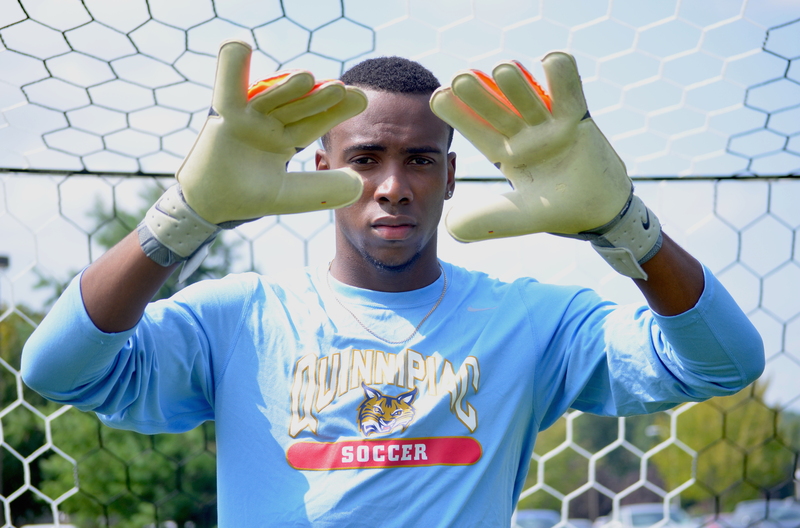 Moving forward, Laden hopes to remain a consistent force in net for the Bobcats. And for Seeley, Laden’s consistency has been key in the evolution of her game. And on a grander scale, Laden also offered up insight into the team’s goals for the rest of the season. The Bobcats would like to win the ECAC, Laden says, and advance to the NCAA Tournament for the first time in program history. Laden and the Bobcats look to continue their winning streak as they hosts Rensselaer at High Point Solutions Arena on Friday at 7 p.m.